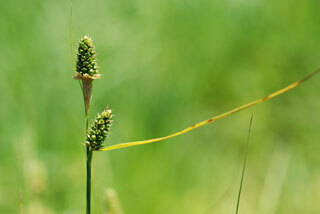 Also Called: Benjamin bush's sedge. Culms: Erect, conspicuously triangular, slender, somewhat stiff, angles rough, sparsely pubescent, more or less reddish at base. Leaves: Up to 5 per culm, flat, firm, .8 to 12 inches long, 1/16 to 1/6 inch wide, shorter than inflorescence, green, soft-hairy to nearly glabrous; margins rolled under. Sheaths: Long, tight, green, soft-hairy; tip often reddish. Ligules: U-shaped, about as long as wide. Inflorescences: Spikes, usually 2-3, stiff, ascending, terminal; lowest involucral bract much exceeding inflorescence; terminal spike cylindric, 1/2 to 2/3 inch long, 1/5 to 2/5 inch wide, with staminate and pistillate flowers, pistillate at top; base club-like; sessile or on short-stalk; lateral spikes 1-2, erect or ascending, 1/5 to 3/5 inch long, 1/5 to 2/5 inch wide, pistillate, usually clustered near tip of culm; nearly sessile; staminate scales lanceolate, pale brown with green midrib, margins lighter, often tinged reddish, tapered to awned tip; pistillate scales lanceolate, 1/8 to 1/4 inch long (including awn), exceeding perigynia, reddish-brown, midrib green, often slightly soft-hairy; tip tapered to spreading awn; awns usually protrude from spike; perigynia 15-30+ per spike, egg-shaped to nearly circular, 1/10 to 1/6 inch long, 1/16 to 1/10 inch wide, swollen, glabrous, olive-green to brownish, 9-13-veined; base stalk-like; beak absent. Flowers: Achene, 1/12 to 1/10 inch long, triangular; very short beak bent to 1 side; very short-stalked; stigmas 3. Habitat: Dry to moist grasslands, margins of woods, upland prairies, old fields, disturbed, open ground, ditches, roadsides. Comments: Loosely tufted. Named for Benjamin Franklin Bush, 1858-1937, a postmaster and amateur botanist in Missouri who discovered it.